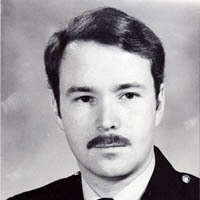 On March 14, 1980, Constable Michael William Sweet and his partner were on patrol when they responded to a robbery in progress. Other officers who arrived shortly thereafter discovered that Constable Sweet had been shot and was being held hostage by the robbers. Constable Sweet pleaded for his life but the robbers refused to let him receive medical treatment. Ninety minutes later, heavily armed police stormed the restaurant and attempted to rescue him. Constable Sweet, however, had lost too much blood and died in hospital.